If you have to add pages to your passport because you only have two to four visa pages left you may do so up to two times over the 10 or 5 years your passport is valid. 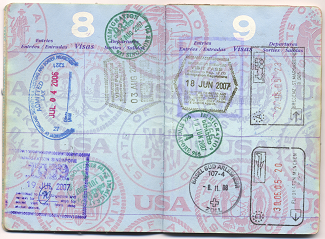 You must have six months validity left on your passport to be able to add the pages. If you have less than six months validity it is time to renew. Using a traceable method mail delivery system you will simply mail the above documents to the address listed on your DS-4085 form. If you travel extensively and are renewing your passport be sure to check the 52 page book option while filling out your DS-82 form. This option allows you to receive a book with twice the amount of pages as the standard book to avoid adding pages down the road. How many blank passport pages do I need to travel? There is no short answer that applies to every traveler. The requirement varies from country to country. If you have (4) blank pages then you are probably fine. If you have less than that it may be an issue. It depends on the country you are visiting that will determine how many blank pages you actually need. Most countries will require that your passport have two (2) blank pages. Some countries require up to four (4) blank visa pages. Some airlines will not allow you to board the plane if this requirement in not met. If you are on a connecting flight to a departure city check with the airlines because sometimes they will not even let you board the flight to your departure city if you passport doesn't have enough blank pages. How many passport pages do you get when you add more? You get 24 new pages for either entry stamps, exit stamps, or visa stamps. You may have additional pages added to your passport twice.